The galaxy’s weirdest barbershop quartet. Part I: Picard, Crusher and Worf are assigned to a secret mission and Edward Jellico (Ronny Cox) is made captain of the Enterprise to deal with some new Cardassian tensions. Jellico’s a jerk and he ruffles everyone’s feathers, notably Riker’s. Meanwhile, Picard, Crusher and Worf leave to determine whether the Cardassians are building some super-bad weapons on a Cardassian planet. They get there and Picard is captured — and he learns there are no weapons and that the whole thing was a trap to get him. Part II: Picard is drugged and tortured by the nasty Gul Madred (David Warner) who is intent on learning the Federation’s defense plans for a particular planet near the border, Minas Corva. The Cardies figured Picard would have known those plans as captain of the Enterprise, hence the trap. Meanwhile, Jellico and Riker clash, and Jellico relieves Riker of duty. As Picard is tortured again and again, the Enterprise learns that a fleet of Cardassian ships is in a Nebula near Minas Corva. Jellico swallows his pride and gets Riker to pilot a shuttle to lay mines on the Cardassian ships. Holding all the cards (hiyo!) Jellico forces the Cardassians to surrender. A visibly affected Picard later returns and takes back the Enterprise, but admits to Troi that he was about to cave to Madred’s torture. Bigger picture, this really cements the Cardassians as power players on par with the Federation, Klingons and Romulans. Up until now, the Cardassians had appeared just twice and seemed more like peripheral bad guys (though well established peripheral bad guys). 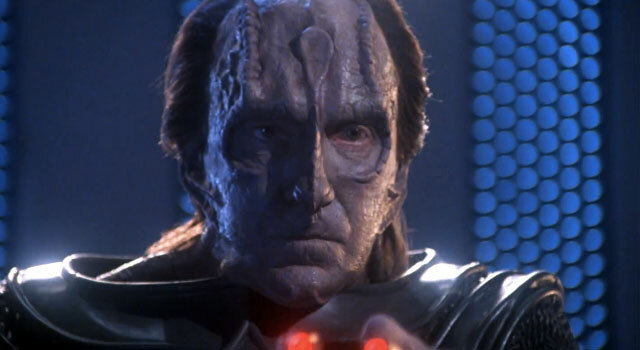 But this episode featured the look and feel of the Cardassians we see over the next seven years. It also likely was produced with DS9 in mind. The tensions Jellico is sent to address stem from the Cardassians redeploying forces that had withdrawn from the Bajoran sector. 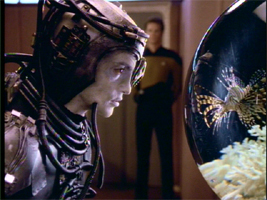 This two-parter aired in December 1992 and DS9’s pilot, “Emissary”, aired in early January 1993. It is a shame we never saw Madred again, though. The tension with Jellico was great — to a point. Unfortunately, the creators hammed it up too much. It’s unlikely Jellico would have been as hard-headed and that the crew (particularly Riker, Geordi and Crusher, in part two) would have been as obstinate. Even if you can shrug off Jellico’s issues, we know that the Enterprise crew is — or should be — more professional. More subtlety would have been appreciated, for almost everyone. The two exceptions are Troi (Marina Sirtis puts in a strong performance) and Data, who’s written and acted appropriately. 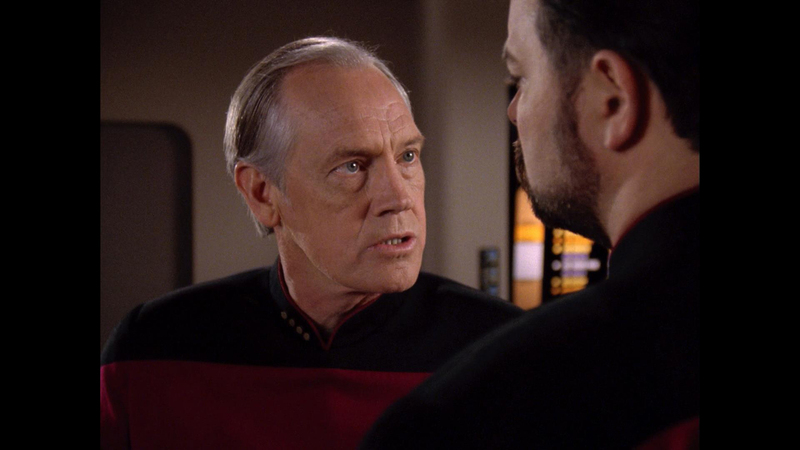 In fact, Jellico is actually in the right in the argument in which he relieves Riker. Picard took the assignment knowing that he’d likely be declared a renegade if he were captured. Riker accuses Jellico of trading Picard’s life to improve his bargaining position, but that’s actually what Jellico should do. We’re talking about the fate of two large space empires compared with the life of one man. It’s too bad Riker didn’t blow his top at another more reasonable time. This episode is actually a good example of Riker-as-chowderhead that we see in TNG’s later seasons. The worst instances are in the “Times Arrow” two-parter — which we won’t review — in which Riker wants to put the lives of Data and Picard ahead of possibly thousands of people on Earth. There’s an awful line where Riker says, “What could be more important than Data?” despite the fact that the crew has learned a bunch of aliens are traveling back to the 19th century for unknown reasons. There and elsewhere in later TNG, Riker’s reactions and dialog are often used to afford other characters the opportunity to explain why tough decisions are being made. In this episode, it provides exposition as to why Picard’s life is mostly forfeit. Riker from earlier seasons would have been smarter. It’s also a little hard to swallow that the Cardassians would go to such lengths to capture Picard, as the plan wouldn’t have had a high success rate. The idea that he’s one of very few Starfleet officers with experience in “theta band emissions” — which are part of the weapons the Cardassians were supposedly developing — is believable, I guess. But given the vastness of space, it would have been very likely that Picard wouldn’t have been around to fall for the trap. Hell, three weeks earlier (in “Rascals”) he was reduced in age to a teenager in a transporter accident! What would the Cardies have done if the effects couldn’t have been reversed — or if the Ferengi mercenaries had captured the Enterprise? Also, I think that Riker, once again, doesn’t get the love he deserves from Starfleet. 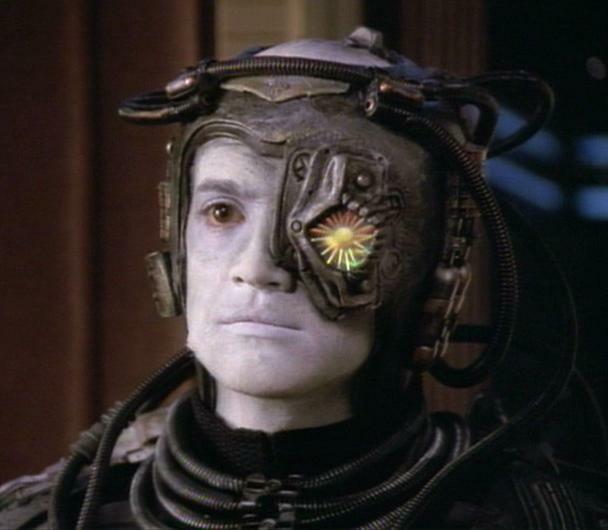 This is a guy who, you know, saved the Federation from the Borg. Even if Admiral Nechayev (Natalija Nogulich) decided on Jellico because of his experience with Cardassians, a line about how everyone appreciates what Riker had done for the Federation would have been appreciated. Hell, Jellico could have even said something about how he thinks Riker got credit that should have gone to the Enterprise crew. Of course, this episode is really all about the torture scenes. 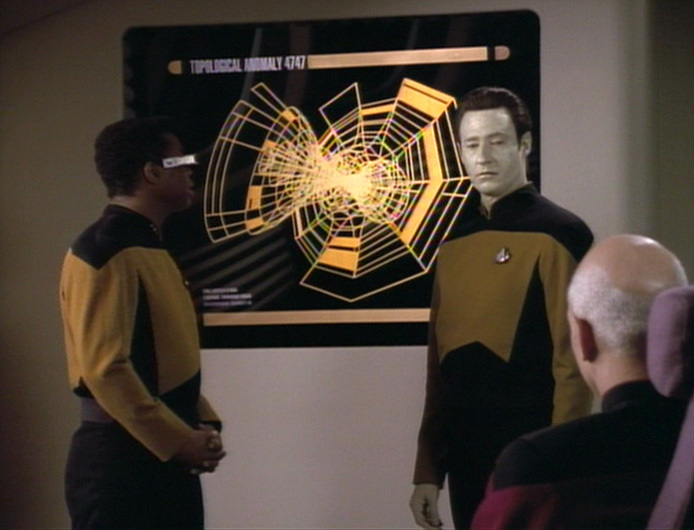 Picard’s refusals to accede to Madred’s wishes — “THERE ARE FOUR LIGHTS!” — are a highlight of the franchise. Stewart and Warner are just so good in this episode that the stretch that is the setup for getting Picard to the planet where he’s tortured is basically worth it. 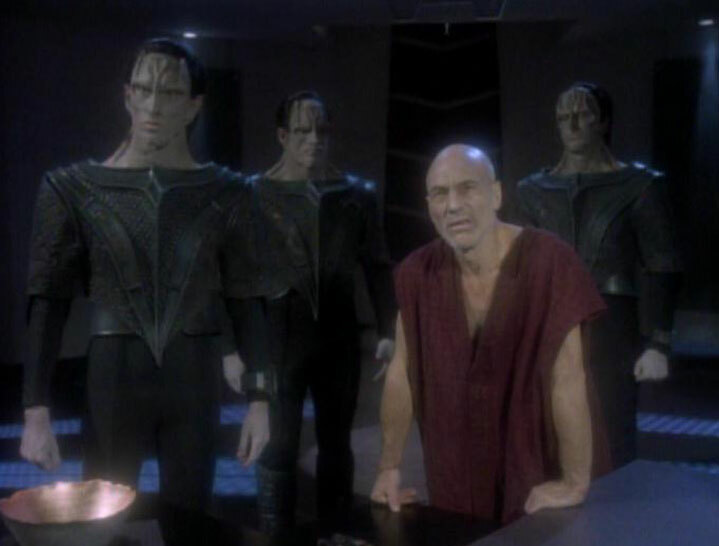 We also get the backdrop about how Cardassians treat prisoners. Their torture skills are discussed a lot on DS9. Although we saw them twice before (in “The Wounded” and “Ensign Ro”) we really didn’t know much about them. We learn a lot here, even though some of the backstory about them doesn’t mesh with what we learn later. Of course, it’s too bad that we didn’t see Ensign Ro (Michelle Forbes) in this episode, in which her comments about Picard’s capture would have been interesting. She appeared in “Rascals”, three episodes prior to part one. It seems like she transferred off the ship shortly thereafter, as she doesn’t appear again for more than a year, in the penultimate TNG episode “Preemptive Strike”. We learn why nearly all Star Trek aliens are bipeds. For serious.